Kim Williams: Source: Kaufman County Sheriff’s Office. 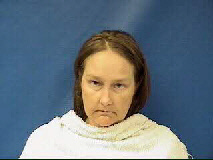 BULLETIN: Kim Williams, the wife of a former local Justice of the Peace, is listed as an inmate at the Kaufman County Jail in Texas on charges of capital murder in the shooting deaths of Kaufman County District Attorney Mike McLelland, his wife Cynthia McLelland — and Assistant District Attorney Mark Hasse. Hasse, 57, was shot and killed Jan. 31 near the Kaufman County Courthouse. The McLellands were found shot and killed in their home March 30, Easter Eve. McClelland’s office had prosecuted Eric Williams, the husband of Kim Williams, on theft charges. Kim Williams, 46, is being held on $10 million surety bond, according to the jail docket. Eric Williams, 46, has been jailed since April 13 on charges of making a terroristic threat. His wife has implicated him in the shooting deaths, according to an affidavit filed by the Kaufman County Sheriff’s Office. CBS News has the arrest affidavit on this page. Also see Dallas Morning News. With Capital Murder charges they are both equally guilty under the law and are subject to severe penalties. What the hell were they thinking? ?